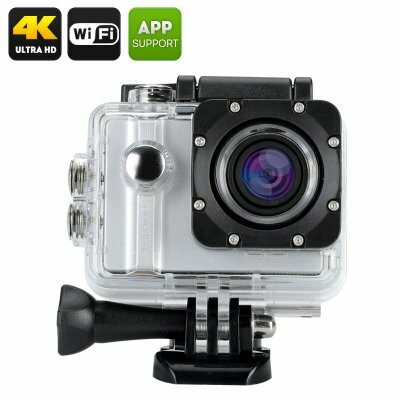 Successfully Added ELE Explorer Pro 4K Sports Camera - Voice Control, Waterproof Case, 5X Zoom 170 Degree Wide Angle Lens (Silver) to your Shopping Cart. Film exciting 4K footage and take cool shots with the 12MP sports cam with Wi-Fi support, 5x zoom and voice broadcast. The ELE Explorer Pro sports camera is the first action camera that comes with voice control and lets you start and stop recording with simple voice prompts. This is a great feature for all adventurers and those who love filming when doing action sports. The 4K sports camera also comes with all the needed mounts, buckles and clips & an IP68 waterproof case for all your water adventures. With the ELE Explorer Pro, you will be able to record 4K footage at 25 frames per second and take crisp photos with the 12MP Sony CMOS senor. No detail will escape your lens thanks to the 5 times zoom and a 170 degree wide angle lens. With Wi-Fi support, you will be able to instantly share your photos and videos or save them on the action camera itself thanks to the support of a 64GB SD card. The 1050mAh battery will give you up to 1.5 hours of non-stop recording time and you will be able to preview all the pics and videos on the 2 inch LCD screen. The ELE Explorer Pro 4K action camera comes with a 12 months warranty, brought to you by the leader in electronic devices as well as wholesale action cameras..